Are you looking for a DVD to teach your child about day to day real life scenarios? Fun, education and includes cute characters? 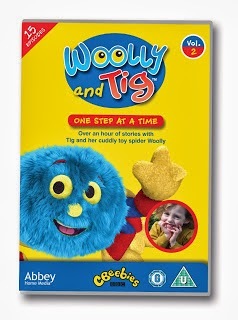 Abbey Home Media has released a new DVD for Woolly and Tig - One Step at a Time. Woolly and Tig is a programme which Max watches regularly and enjoys. The DVD was released on the 16th September and is a great DVD to add to any family collection. Woolly and Tig are a spider and a girl who have lots of adventures together. Tig finds new experiences scary and her favourite toy gives her confidence to continue her day. Each episode is narrated by Tig as she tells viewers about the world around her and what she gets up to. 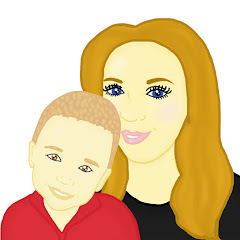 Each episode of the DVD is aimed at scenario your child may have to deal with in the future, from shopping in the supermarket to being scared of water Woolly and Tig try and assure the viewer these scenarios will work out okay. The DVD was over an hour long, and contains 15 episodes all which last 5 minutes: One Step at a Time, Timmy's Monsters, Splash, The Painting Day, Museum of Inspiration, The Dog, Bus Ride, Supermarket, The Hospital, Sleep Over, Busy, Big Stomps, The Dance Class, The Clown and The Party. Maxwell loves the characters - especially Woolly as he is very bright and friendly. Overall the DVD got the big thumbs up from me. The DVD teaches children not to be scared about day to day life situations and helps them build confidence about the world around them. Although Maxwell is a little too young to understand such situations he was still able to follow what was happening and as he grows up I hope he can understand and learn from the DVD. I liked the short episodes as we are able to view them when we have limited time.